So, let me tell you about this chorizo and pepper frittata. It was originally going to be vegetarian. It was, I swear. I know that my vegetarian section is woefully empty and I need to fill it with more recipes. I do. But then when I first made it I was shopping for ingredients and I saw this pack of chorizo and…well. I’m weak, I know. I made this for the first time in 2012, when I’d first moved to London and was trying out new things on my then-boyfriend now-husband. Three years later, it’s still as delicious as it was the first time – especially since I’ve now removed the parsley, which I loathe. Even if it’s really, really un-photogenic. Although the ingredients look super pretty before you cook them. So there’ s that. It’s easiest if you start by preparing everything. Dice the potatoes, then slice them so you end up with small slices. Dice the chorizo. Then chop the peppers into chunks, chop the parsley and slice the spring onion. Get the cheese grated for when you need it. Fry the chorizo until just cooked. 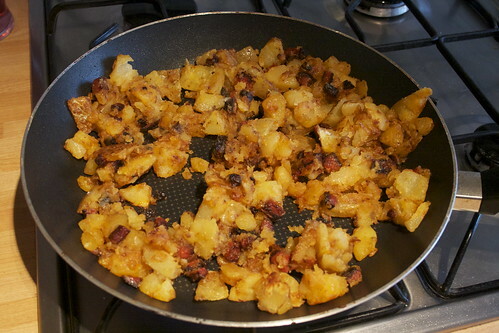 Then add the potatoes, spraying well with Fry Light. Fry for 5-10 minutes until coated in the chorizo oil and just getting crispy. 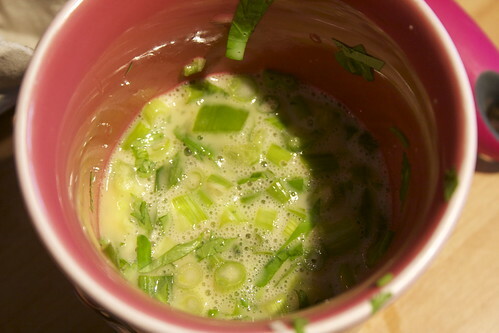 Mix together the eggs, peppers, and spring onion. Add some salt and pepper to taste. I always do this in a large mug and beat with a fork — it’s just easier. Heat the grill to medium-high. Then tip the eggs into the pan, quickly mixing everything together. 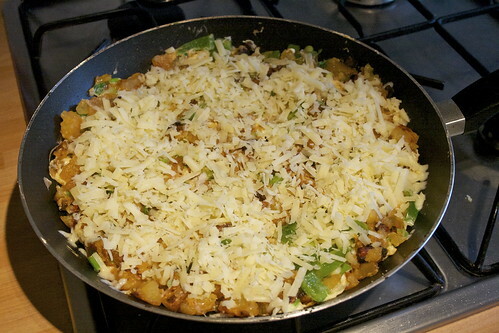 Lower the heat and sprinkle the cheese over the top. After 5-10 minutes, the egg will be just about set. Take the pan off the heat and pop it under the grill until it’s firm, golden and the cheese has melted. Slice it into quarters and serve it, either on its own or with salad. Not going to lie, Garry and I usually have half each. It was just too good not to. Sounds so yummy! Definatly going to make this. 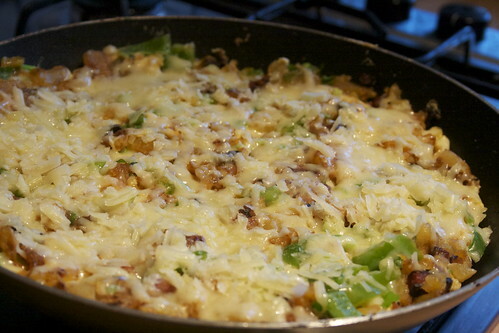 Not to much cheese so its perfect for my slimming world diet! This looks so yummy, I’m going to get Mark to make it for me, haha!